High Tech Connections produces one of the most comprehensive lines of power cords and cord sets meeting the power demands of a discerning global marketplace. North American manufacturers can now select power cords already bearing the correct safety agency approval mark of the destination country. Off-the-shelf cords include those for use in Austria, Australia, Belgium, Finland, France, Germany, The Netherlands, New Zealand, Norway, Portugal, Spain and Sweden. High Tech Connections also features the special fused cords required in the United Kingdom and Ireland. 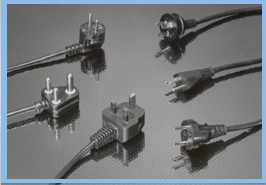 Power supply cords, cord sets and jumper cords are also available for use in countries not mentioned above. Engineers can specify custom cord lengths, jacket colors, special lead terminations and more, even in small quantities. High Tech Connections can also provide popular cord-related accessory products such as assembled EN/IEC cord connectors, power outlet strips and HAR / VDE-marked bulk cordage for in-house assembly.